Click here to create a sample email to DHEC in your email program. 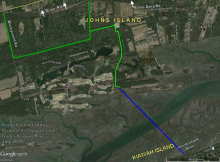 Kiawah Island Utility (KIU) is proposing to build a new water line under the Kiawah River and marsh from Johns Island to the eastern end of Kiawah. (see maps included with DHEC application). The project will use an innovative technology called horizontal directional drilling (HDD) which has matured significantly in the last two decades. The new line will go over a mile under the marsh, will require fair sized construction sites on both sides of the river and take approximately 4 months to complete. The work requires and the company has applied for a permit from SC Department of Health and Environmental control (DHEC). A PDF version of the application (OCRM-15-210-E) with maps can be downloaded from DHEC website. The deadline for public comments on the application is Wednesday, August 5. Currently there are no plans to hold public hearings â€“ UNLESS there are sufficient requests for one submitted by August 5. Kiawah Island Utiltiy has proven themselves a responsible private operator over their 40 year history. However, this is a very major project, the first of this size for them and will be going directly under a very important and sensitive environmental area. We believe full information and public hearings are in everyone’s best interest, including KIU. We will be emailing DHEC and requesting public hearings and would encourage those interested in Johns Island to do the same. The email address is eiserwc@dhec.sc.gov. Please copy us at the Conservancy (info@jicsc.org) so we can keep track of the number of requests DHEC gets. You can also email county council members who also have the authority to request public hearings. Click here to create a sample email in your email program. You can then edit or personalize the email before sending. Click here to select your county council member and create an email to them.